Kens the forth-coming Rod, unpleasing Sight, I ween. Nice to see that that other staple of old-fashioned education, the rod, gets its mention. No child back then risked being spoiled by the sparing of the rod. Seemed to work in my day too. 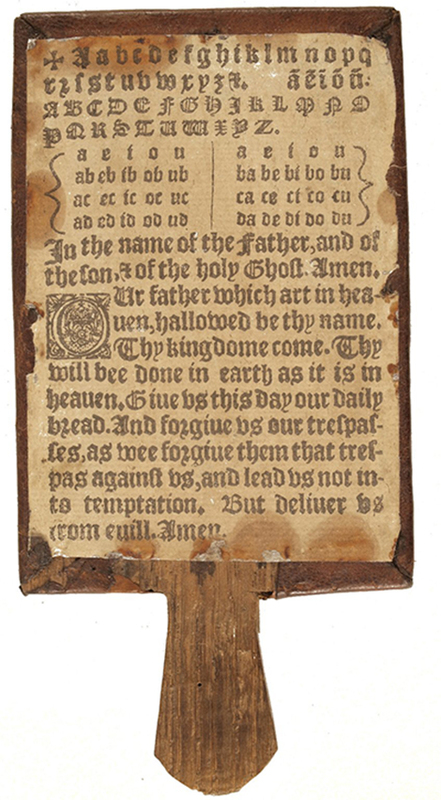 The top left of the sheet shows a cross, from which the hornbook got the nick-name Christ Cross Row, or criss-cross-row. The alphabet in small and large letters was followed by the vowels and their combinations with the consonants in tabular format. The Trinitarian formula – “In the name of the Father and of the Son and of the Holy Ghost. Amen” – followed, then the Lord’s Prayer. The hornbook often concluded with the Roman numerals.